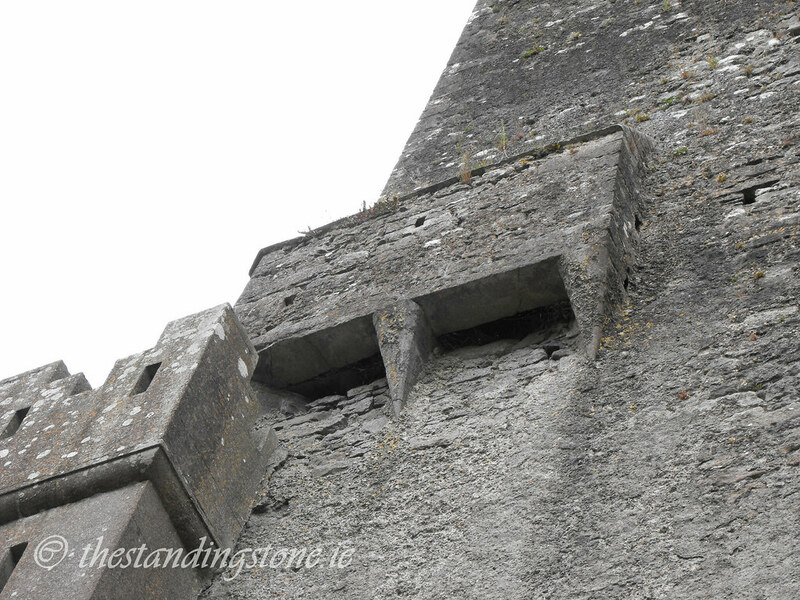 The Standing Stone: Leap Castle, Co. Offaly. 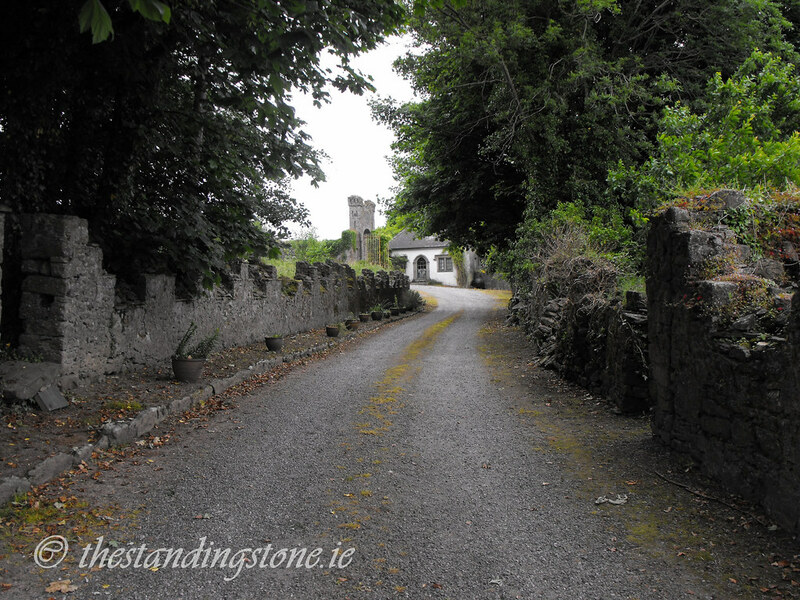 Location – On the R421, N of Roscrea. GPS: S 12823 97539 (Accuracy: 5m) - Reading taken at the entrance gate. 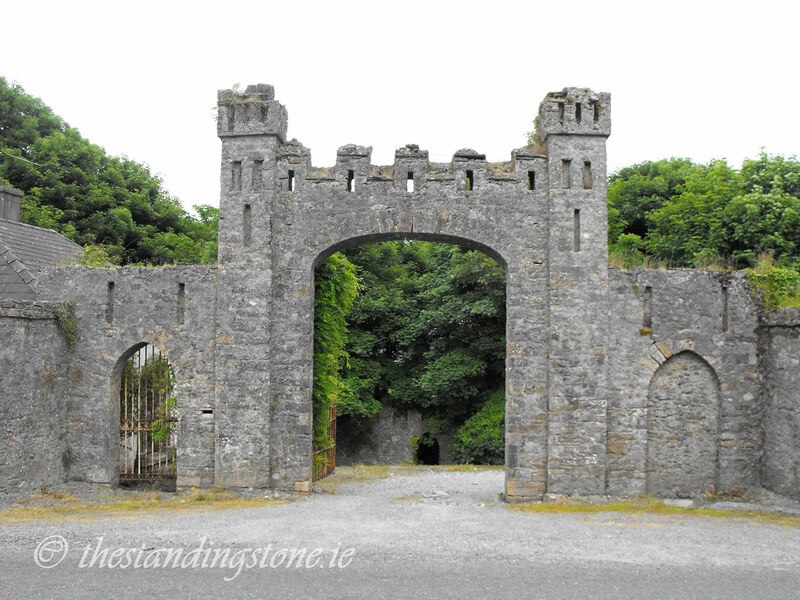 Description and History – The first time that I visited Leap castle I was unable to get inside, but I was determined to go back and update and expand this post as Leap castle is somewhat famous amongst certain circles and has earned itself the epithet of ‘the most haunted castle in Ireland’. This ‘haunted’ reputation has somewhat distracted from the beautiful castle that this is. 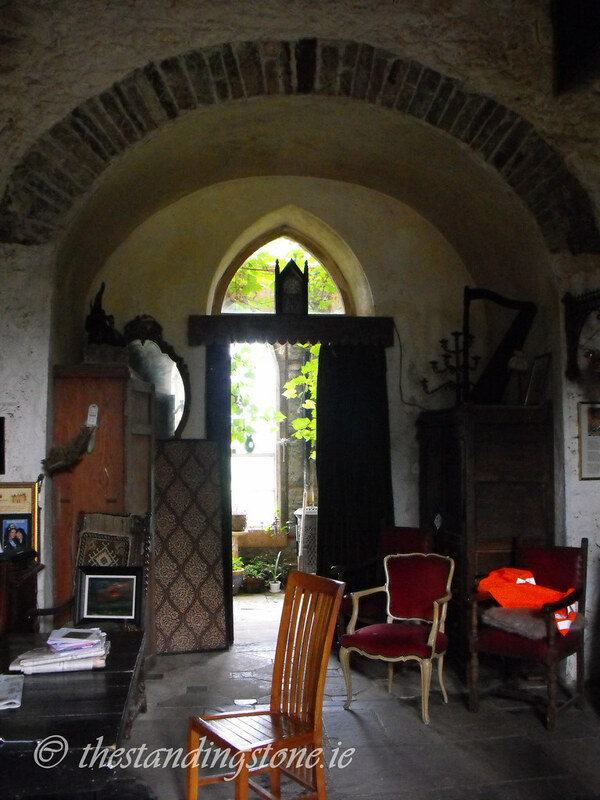 In the manner of Loughmoe castle in Tipperary, Leap is a modified tower house that has been converted into a later fortified house. 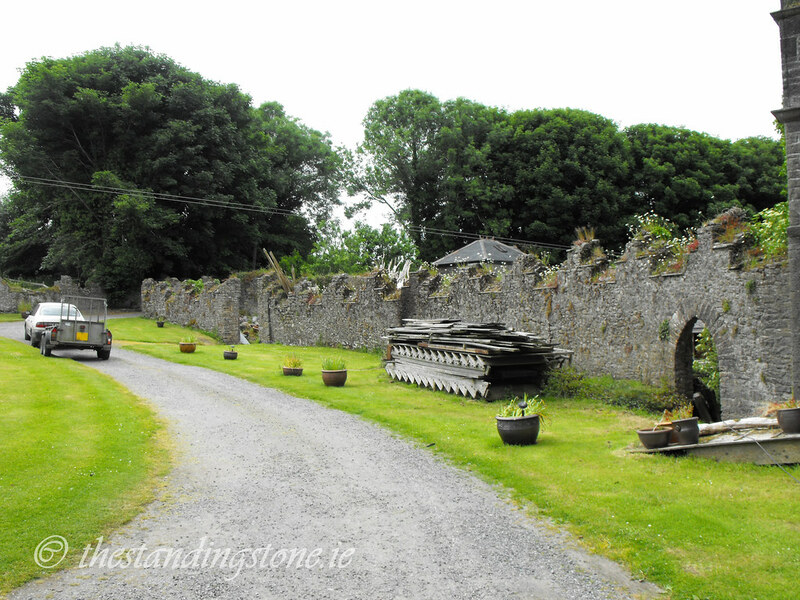 Unusually, portions of the castle are still habited by musician Sean Ryan and his family who are undertaking restoration work. and have owned the castle since 1991. The original tower house is clearly visible in the centre, while the later additions are in a ruinous state (it seems that even by the 17th century they didn’t make them like they use to). 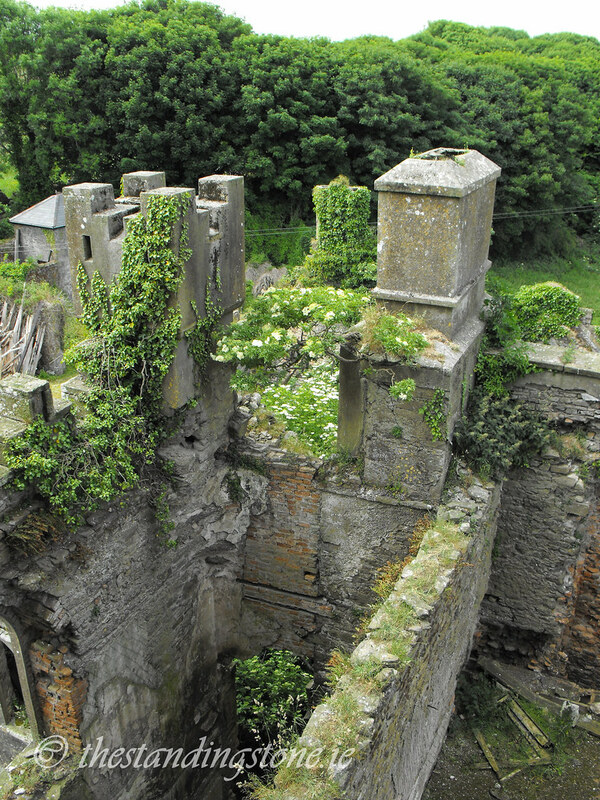 Constructed in the late 15th century or early 16th century, Leap castle has had a turbulent history. 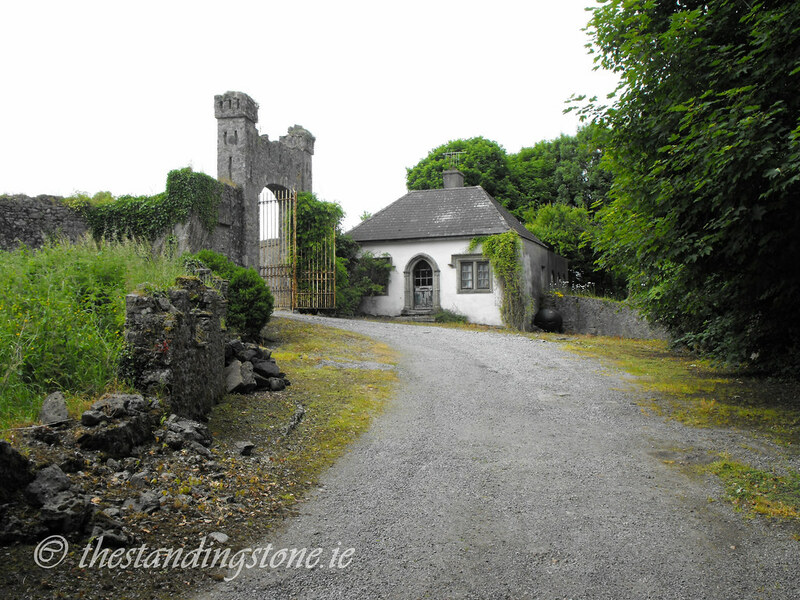 Built by the O’Bannon clan it later became the principle seat of the O’Carrolls. The castle was attacked early in its history in 1514 by the Earl of Kildare who, unsuccessfully, tried to seize the castle. It was attacked for a second time in 1516. In 1558 the castle was deliberately set on fire and ruined to prevent it being captured by Elizabethan forces, who decided to occupy the castle anyway. 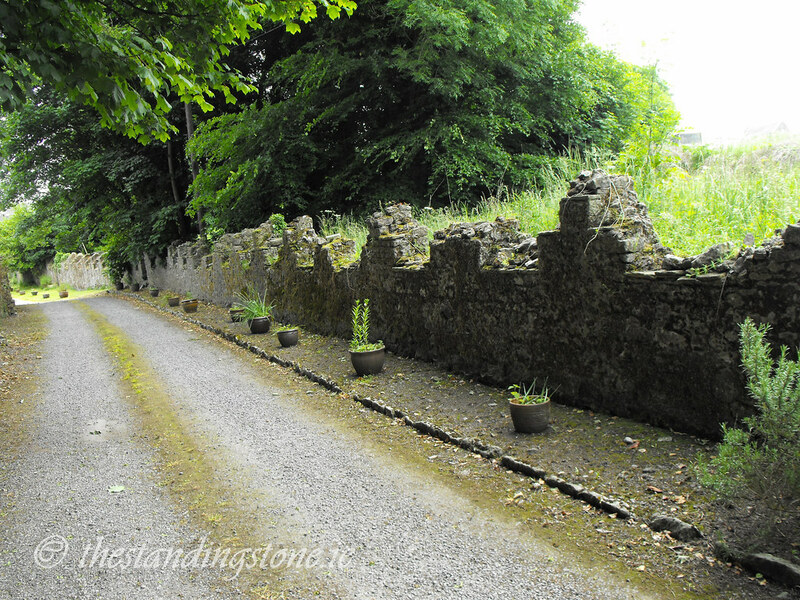 It was recaptured by the O’Carrolls less than a year later. 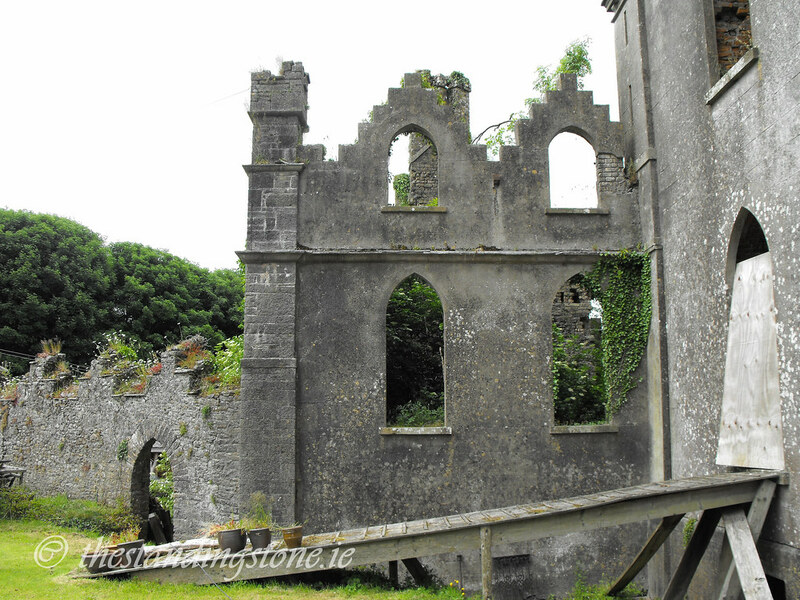 The castle was altered during the 17th century when the castle was occupied by the Darby family. They extended the castle and added the Jacobean house to the N face of the tower house. A later Georgian house was also added. I will reserve a description of the inside of the castle until I finally get in there. 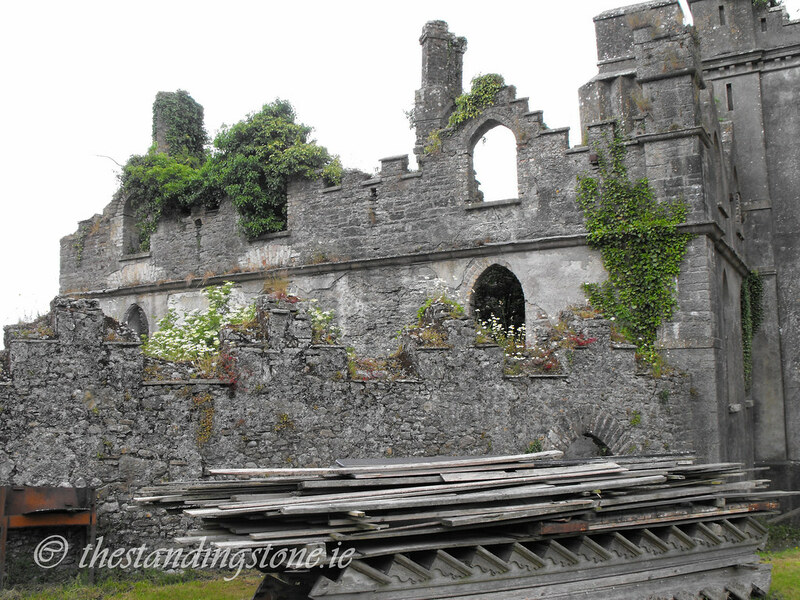 The castle was finally destroyed by 30 bombs and 20 cases of petrol in 1922 during the civil war. 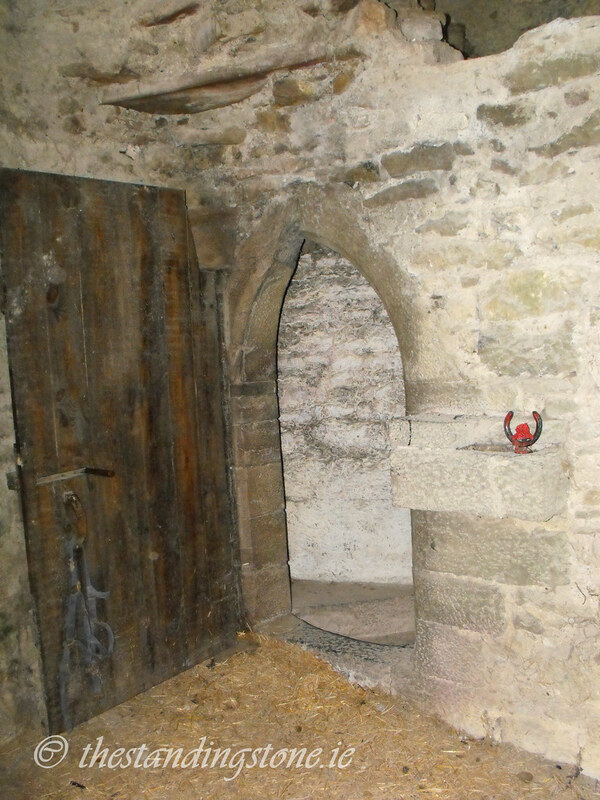 The entrance to the castle is quite interesting and dates to a period of rebuilding in the late 16th century. I've never seen an entrance to a tower house before that was so grand and richly carved. 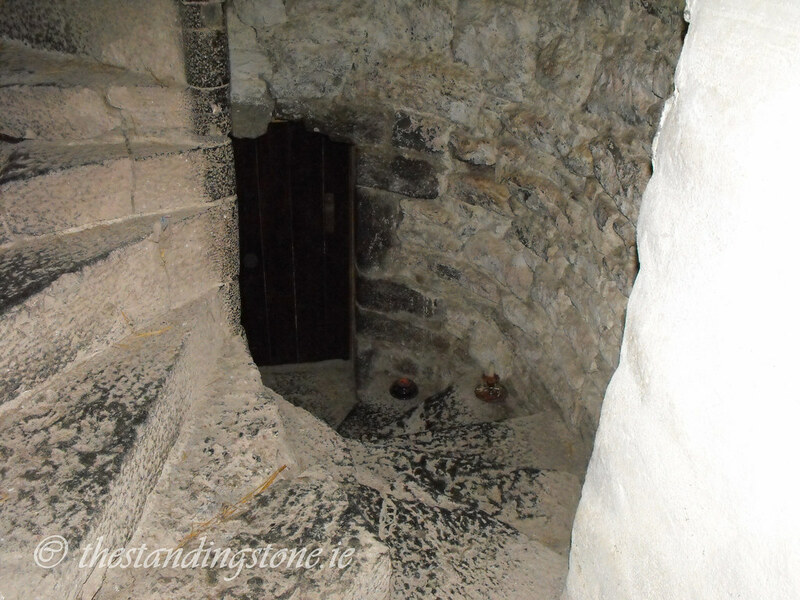 When you enter the castle's ground floor you are faced with a large recess in the E wall that belongs to the castles original entrance. It is now a large window. Passages off this first floor lead to the two, more recent, wings. 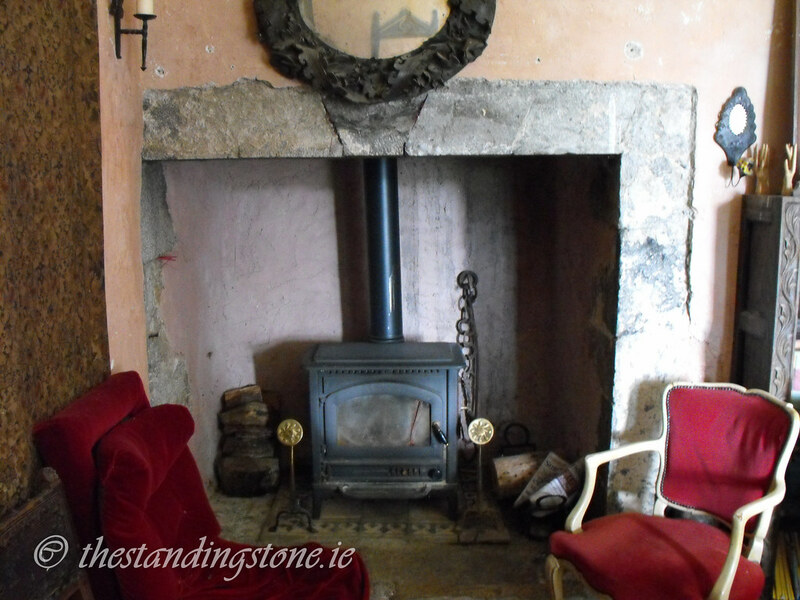 The first floor, like the ground level, has been restored and has a fine medieval fireplace although there is no carving on it. 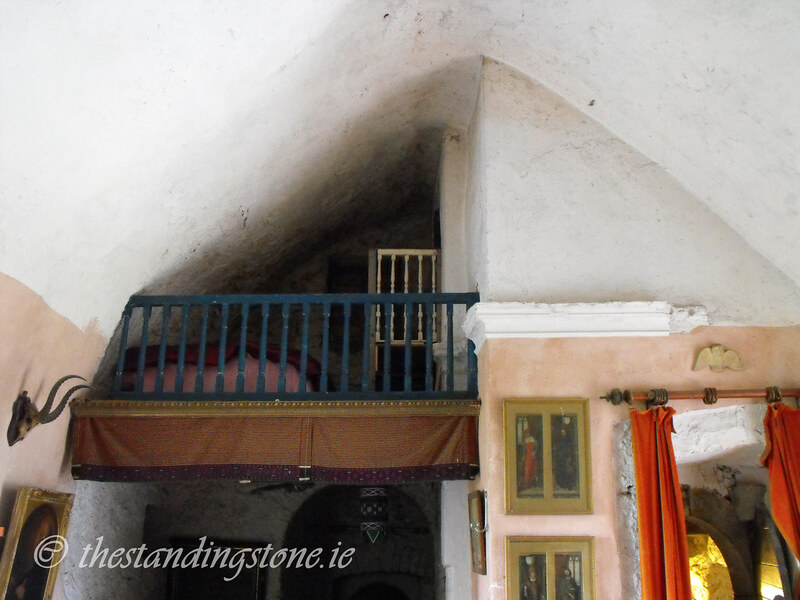 There is a small gallery overlooking the first floor that is reached through the spiral stairs. The top floor is the so-called bloody chapel where many people have died. 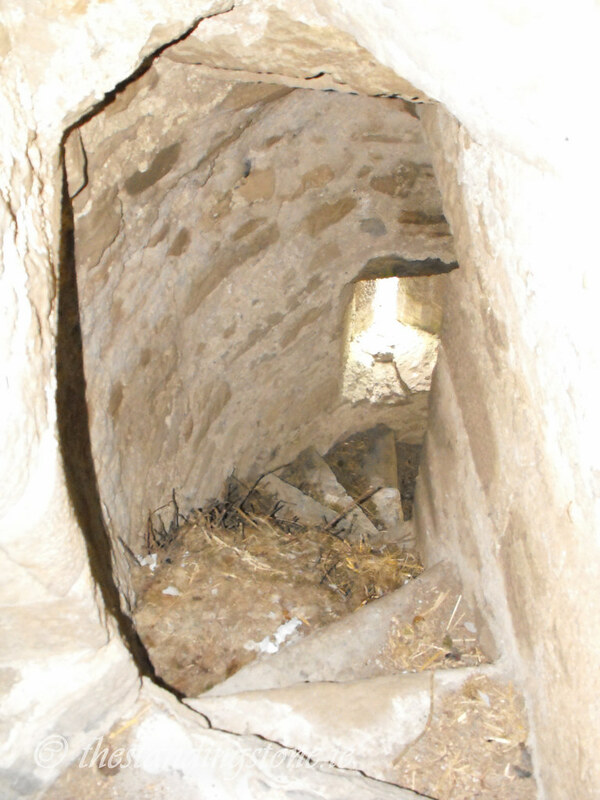 The oubliette is a great feature or the castle and it is not often that one is so easily accessible. 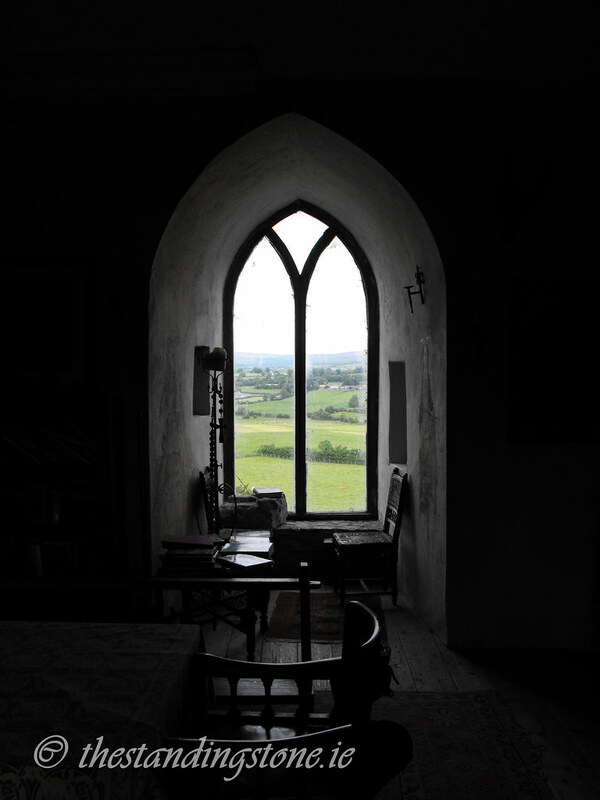 The windows all appear to be later insertions into the castle but are fine late medieval examples of Gothic revival architectures. 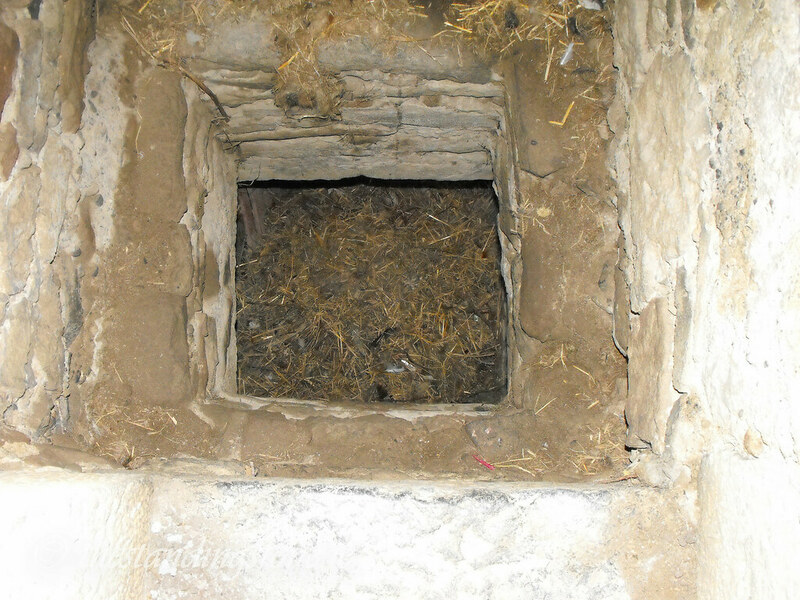 If you head up here watch your step it is easy to trip and I nearly fell through the machicolation which is covered with straw. A modern tin roof covers the top floor. 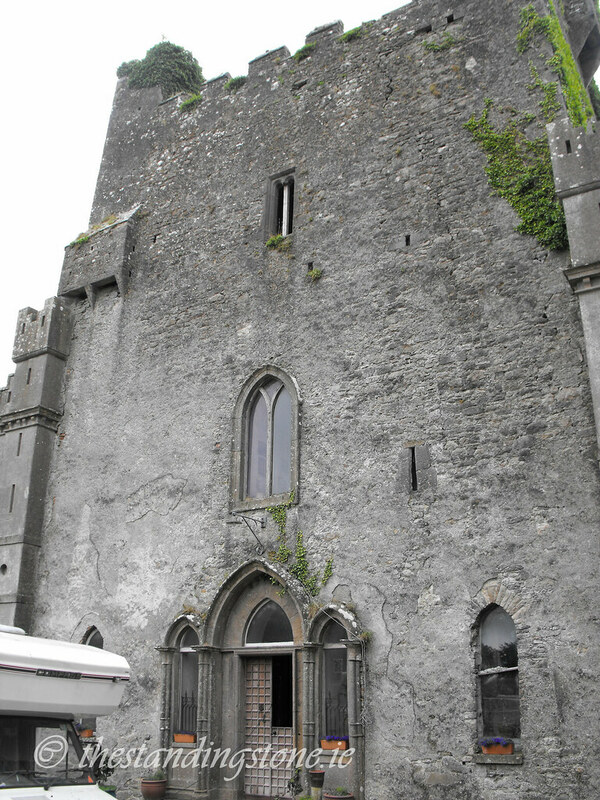 The wings of the castle are from a later date and the S wing is private and occupied by the Ryan family. The N wing is derelict and too dangerous to enter. This is a shame because there is a fine Jacobean fireplace in there. I hope it can be salvaged before it succumbs to time and collapses. 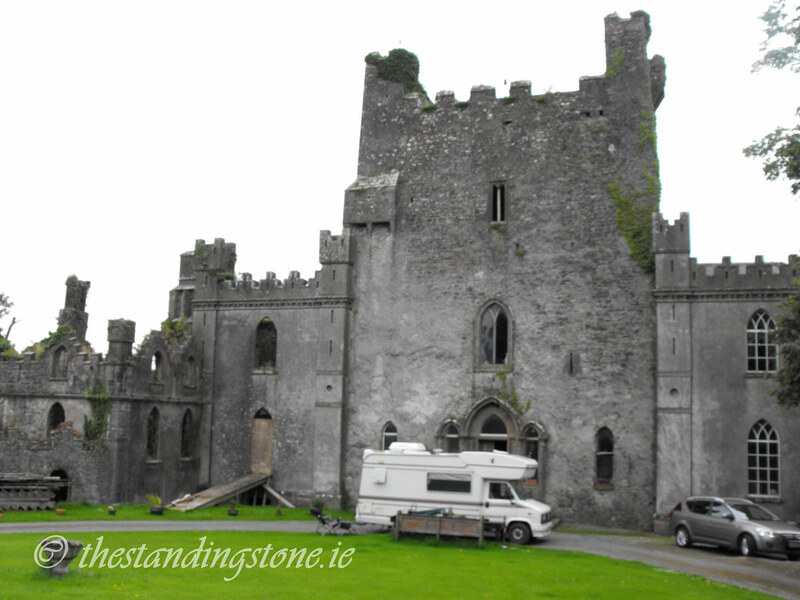 For those of you who know Leap castle for its many appearance on TV ghost shows there are many stories surrounding the castle. 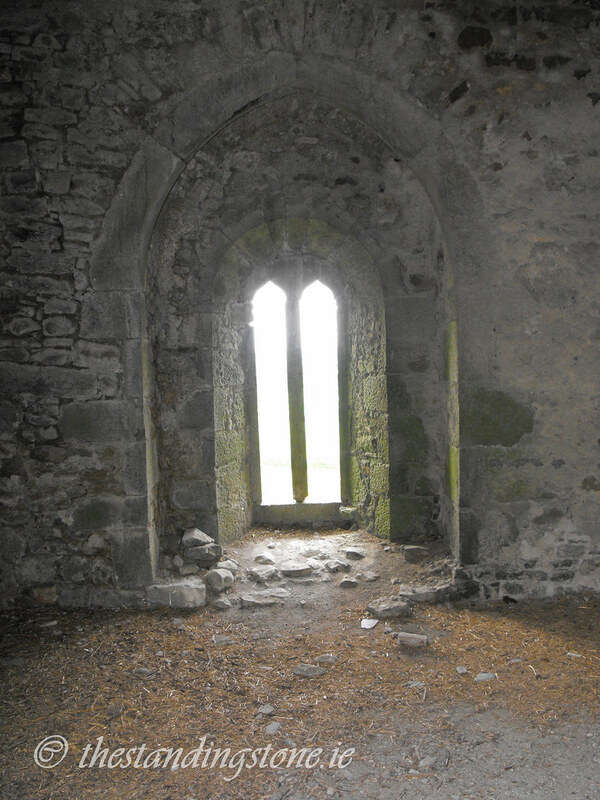 Its haunted reputation goes back to the 17th century when servants of the Darbys would not enter the upper parts of the castle because of ghosts associated with the O’Carrolls, who, according to local legend, would throw enemies to their deaths from the top of the castle. An account survives from the 17th century from Mrs. Jonathan Darby and her alleged encounter with a type of ghost called an “elemental”. It runs as follows: “The thing was about the size of a sheep, thin, gaunt and shadow in parts. Its face was human, or to be more accurate, inhuman, in its vileness, with large holes of blackness for eyes, loose slobbery lips, and a thick saliva dripping jaw, sloping back suddenly into its neck. Nose it had none, only spreading cancerous cavities, the whole face being a uniform tint of grey. This too was the colour of the dark coarse hair covering its head, neck and body. Its fore arms were thickly coated with the same hair, so were its paws, large loose and handshaped and as it sat on its hind legs, one hand or paw was raised, and a claw like finger was extended ready to scratch the paint. Its lustreless eyes, which seemed half decomposed in black activities, and looked incredibly foul, stared into mine, and the horrible smell which had before offended my nostrils, only a hundred times intensified, came up into my face, filling me with a deadly nausea. 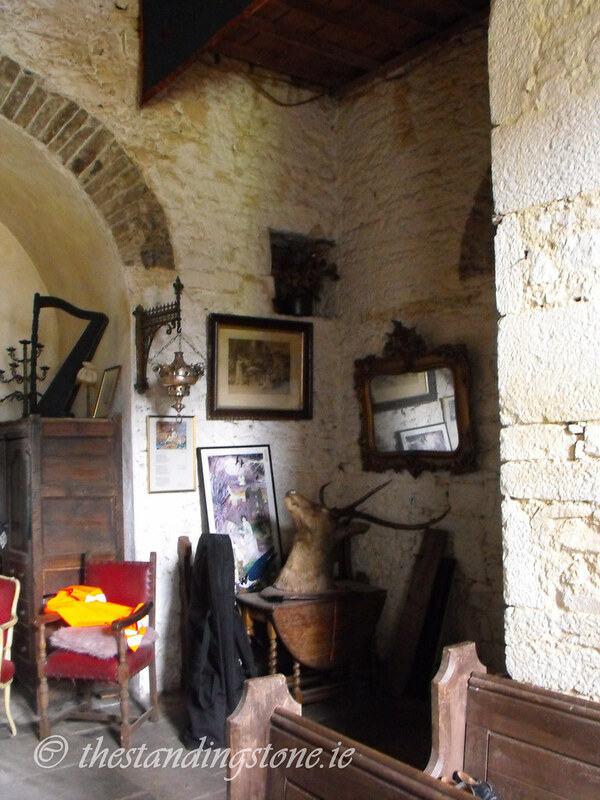 I noticed the lower half of the creature was indefinite and seemed semi-transparent at least, I could see the framework of the door that led into the gallery through its body.” Mediums and ghost hunters are frequent visitors to this castle now in search of the elemental and other ghosts. 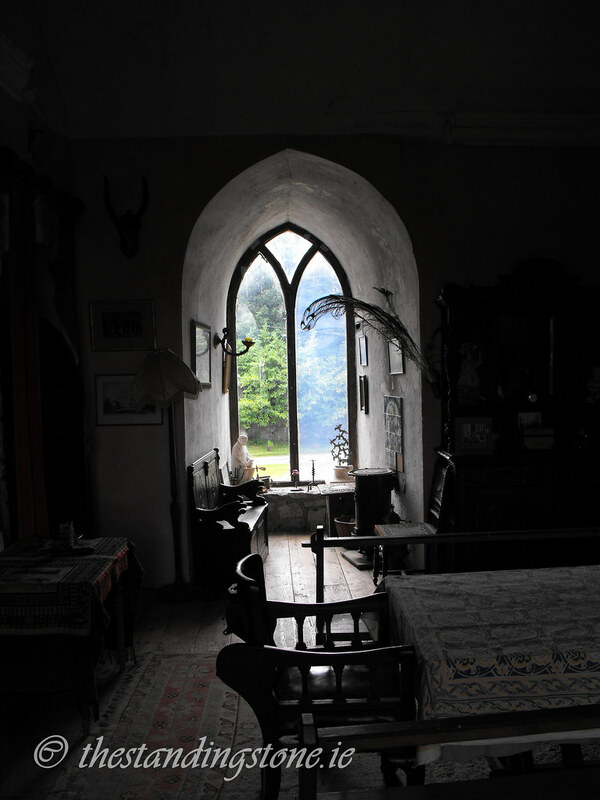 Another ghost is apparently of one of the O’Carrolls who was a priest and was killed saying mass by his brother in the chapel room. 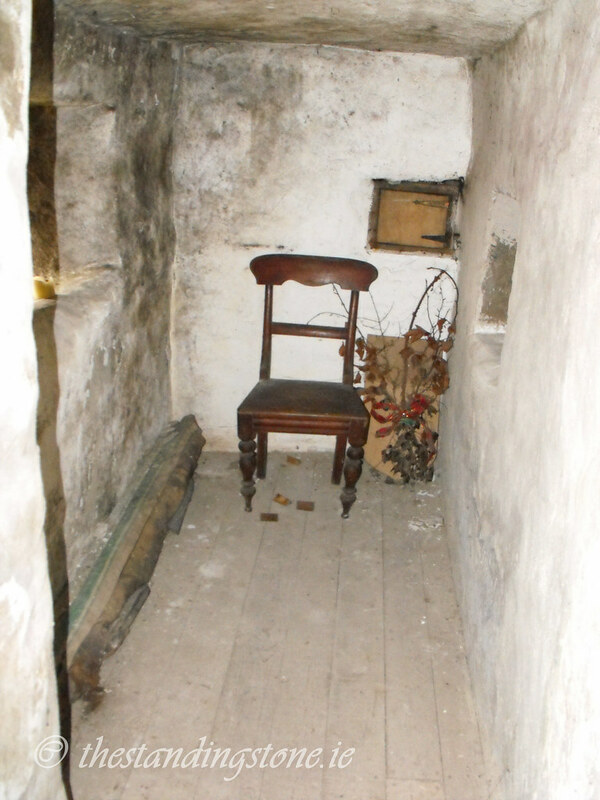 Other ghosts are associated with the oubliette in the top floor in which three carts full of bones were removed in the early 20th century where people had been thrown to their deaths onto the metal spikes below. If you like ghosts you will enjoy this castle. If, like me, you are a sceptic, you will still enjoy this castle for its architecture and history. 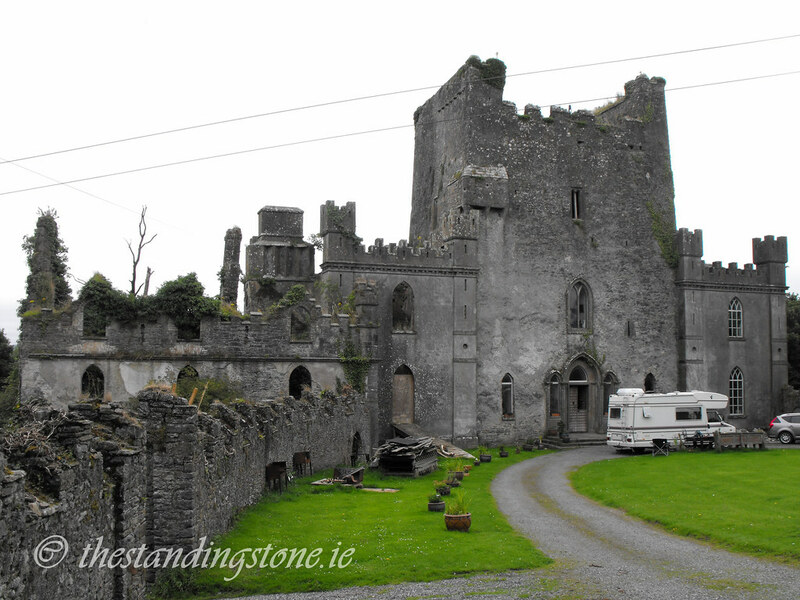 Although this castle is known as the most haunted castle in Ireland you will be disappointed to read that I didn't see, hear or feel a thing. It seemed like a normal castle to me. However, even though I'm not a believer in the supernatural I must admit that all the ghost stories did pop into my head as I went up the pitch black spiral stairs. I was glad I had remembered my torch. Main entrance to the castle. Part of the later additions to the castle. The phrase "they don't build them like they use to" springs to mind. 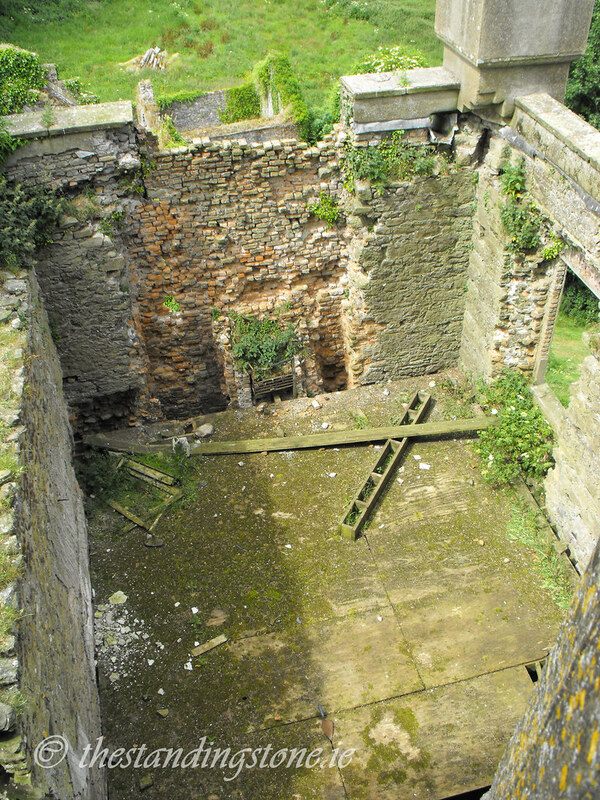 The later additions are in a much worse condition than the original tower house. 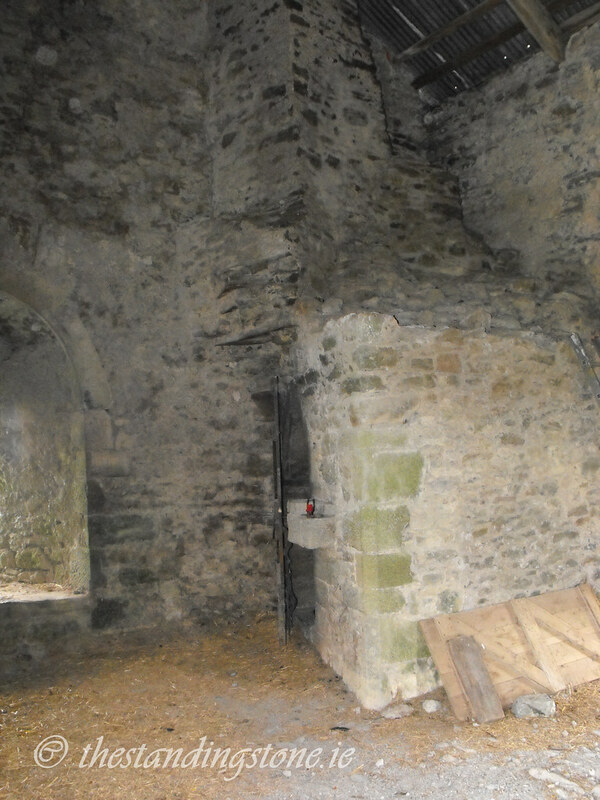 This is where the original entrance was in what is now the rear of the castle. 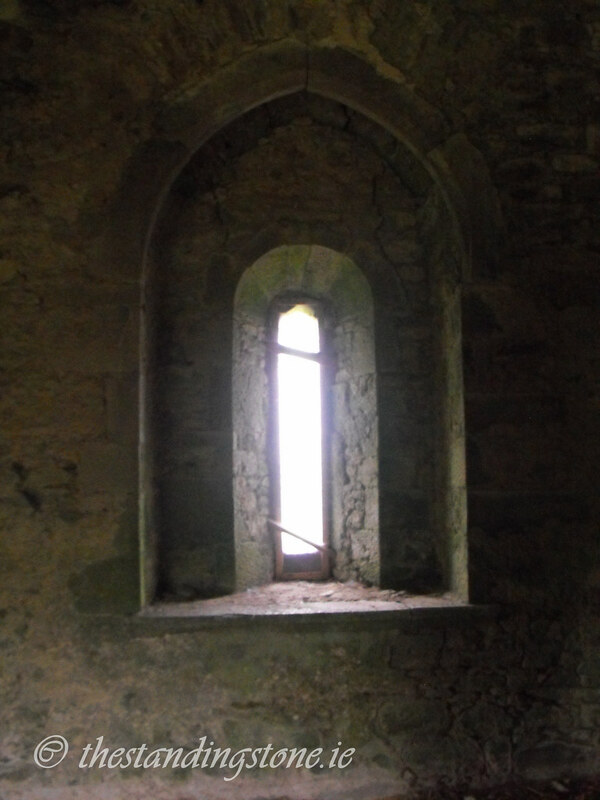 One of two windows on the first floor. 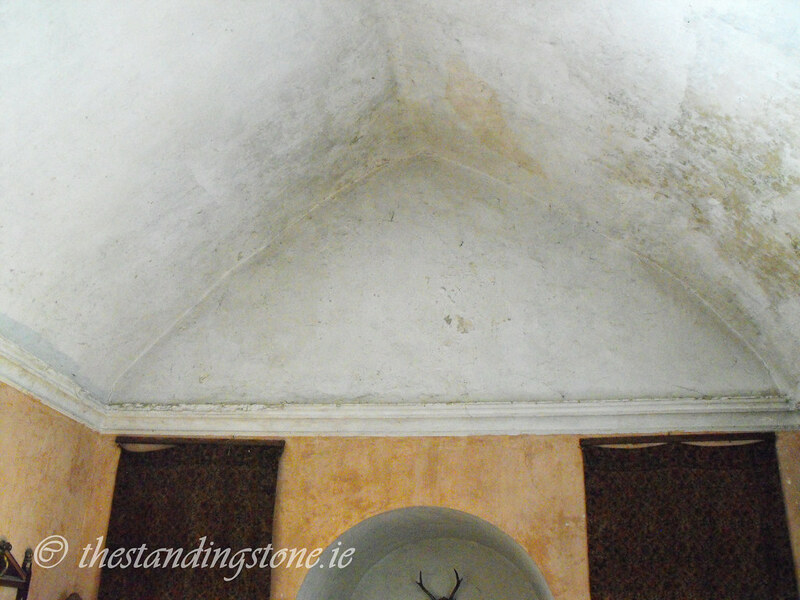 The barrel vault has been nicely restored and doesn't seem to get too much damp rot. 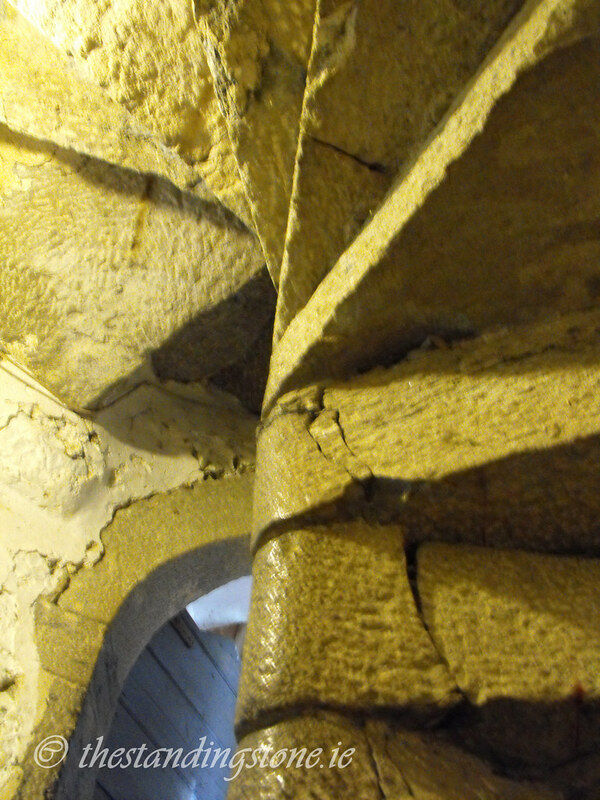 The spiral stairs leading up to the bloody chapel. 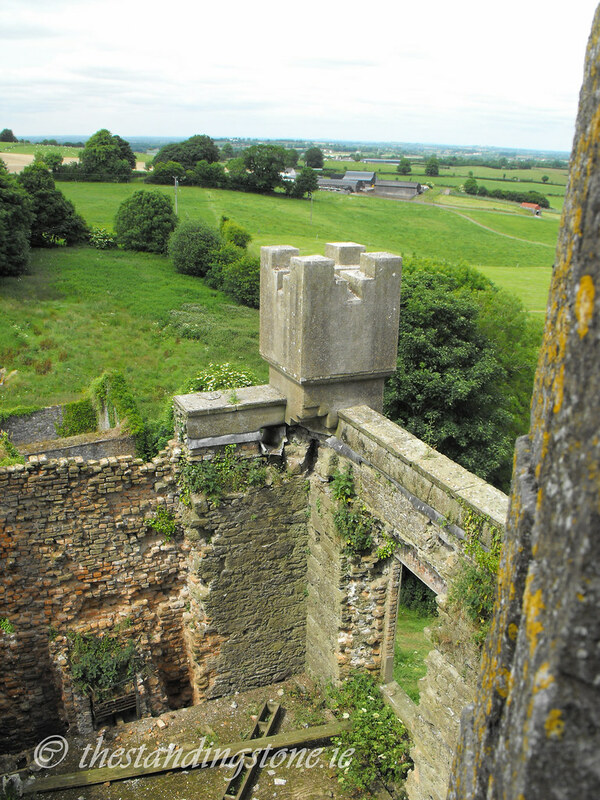 Looking down on the ruined later parts of the castle. 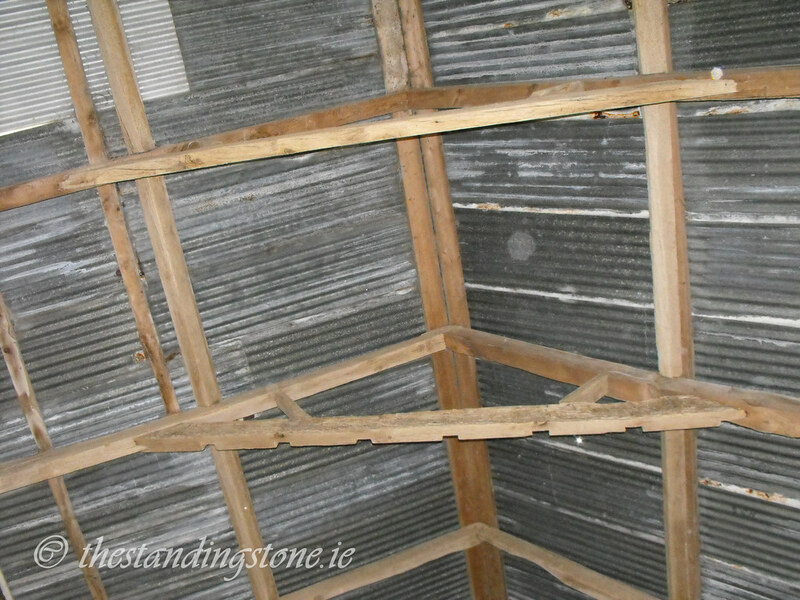 The newly inserted tin roof. 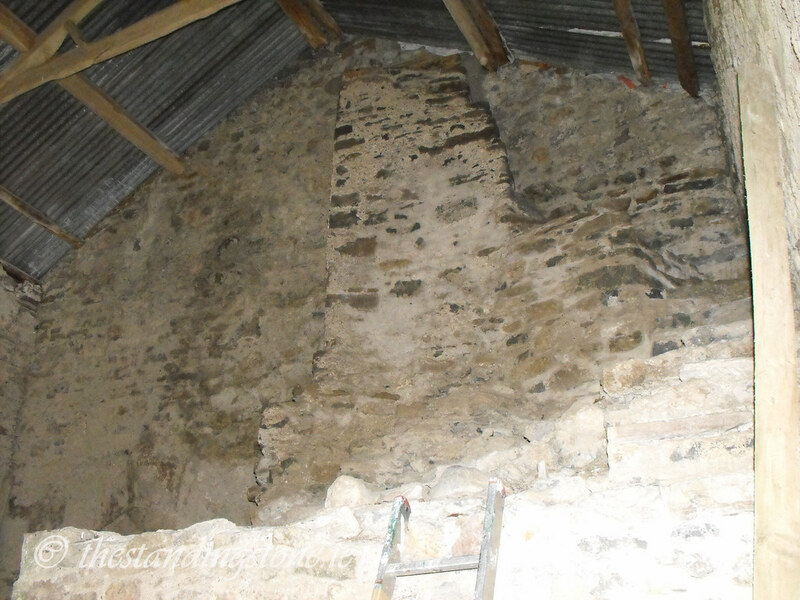 The stairs in the corner lead to an outside wall walk. As a descendent of the O'Bannon clan (my great great grandmother was Mahannah O'Bannon) I enjoyed reading your description of Leap Castle. I hope to have the opportunity to visit there one day myself. My favorite place and my favorite story. 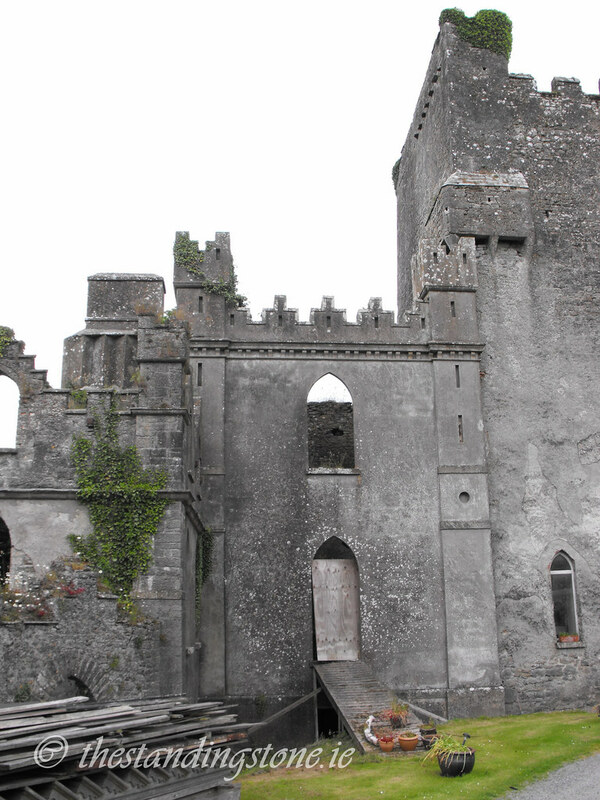 As a descendent of the O'Carroll clan,I enjoyed reading of the Leap Castle. Have seen it on TV many times. Have always wanted to visit there. The owners have estimable tastes. No Ikea there. Can you imagining tripping there? As a descendent of the O'Carroll clan, I much enjoyed the pictures and interesting history, especially about the "blood feuds" and spirit realm, which (for those in the know) has encompassed "the hidden war". I too descend from the O'Bannon clan (Bryan O'Bannon was my 8th great grandfather, also Mahanna O'Bannon was my 4th great grandmother). 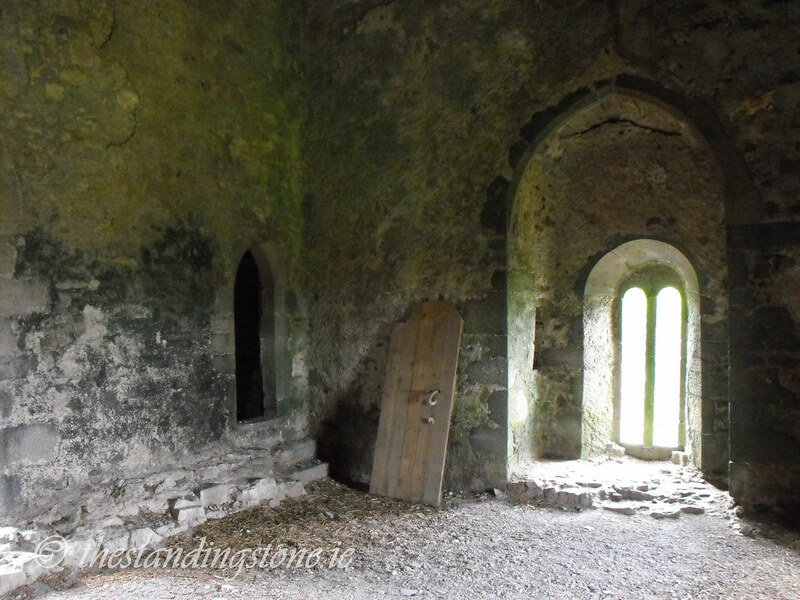 I can only dream of visiting Leap Castle, so sincerely appreciate the details and photos you have provided. Also thank you for this thread as it was an opportunity to make connection with family (Dar Wise). Mahanna O'Bannon was my 4th great grandmother and Bryan Boru O'Bannon my 8th great grandfather(he was the first O'Bannon in America from Ireland). I can only hope for the opportunity to one day see Leap in person I sincerely appreciate the details and photos. My husband and I visited the castle in 1999. It's a beautiful place and very interesting. 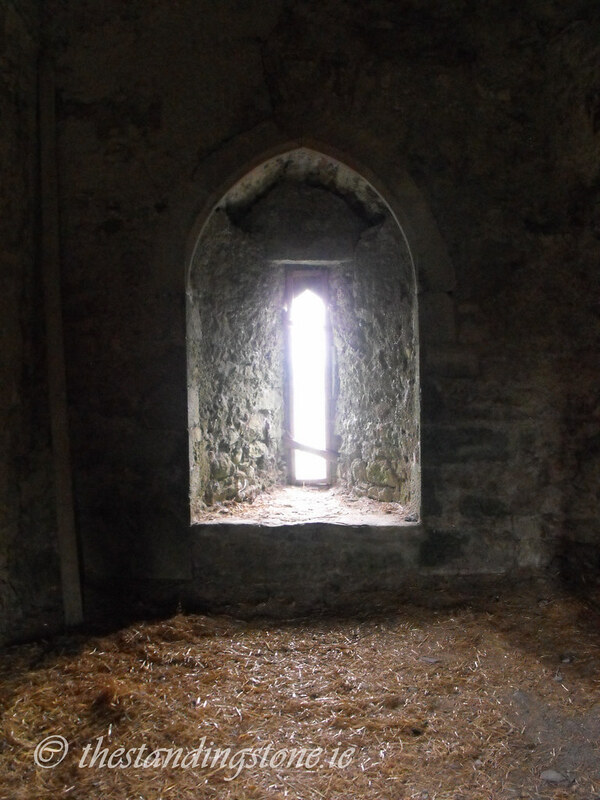 We wandered all through it, but when we came to the door to the oubliette, I could not walk past it. I was terrified. No one else seemed to notice anything. I asked what the door led to and was told by the lady, "The dungeon." That explained it and I sidled by it to the next room to get away. I wanted to open the door, but was too scared. I hope to go back someday and may be able to open that door. I to am a Bannon. Our Family emigrated from Ireland to Lower Canada (Quebec) in the late 1700's. My GrGr Grandfather moved down to North Creek NY in the late 1800's My Family and I live near Glens Falls NY. My wife and I visited Leap in 1983. It was a ruin in the field at the time. I roamed around in it for quite a while until I was overcome by a spooky sense or feeling. I new nothing about it's history at the time. We went up into the Bloody Chapel, looked down into the pit etc. Lucky we didn't fall through floor boards. 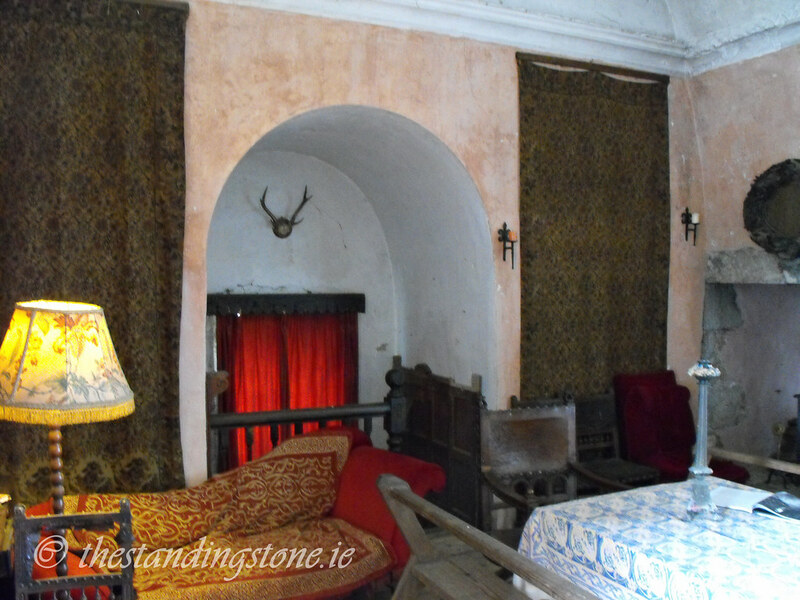 We returned in the 1990's when Sean Ryan was renovating it and he was kind enough to show us around. This was only after he realized I was a Bannon. It's quite a place and well worth a visit.